The 1st step you take on Mailchimp is creating your Subscriber List. Subscribers are the contacts that will receive your emails from MailChimp. 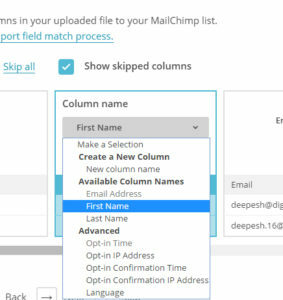 MailChimp manages your subscribers in different lists. You can create multiple lists or you can create multiple segments in a list. Each list is a separate entity so subscriber data in one list is not a part of another list unless we add them to multiple lists. Moreover, different Lists have to be managed separately. Users will have to subscribe to each list separately. You should create the least number of lists on MailChimp. Create a new separate list when you are 100% sure that you do not want to manage them separately. To keep the email list clean, it is necessary to map the fields with the attributes you have identified in the step2 with the fields of your subscriber list appropriately. You do not need to restrict yourself to the fields suggested by Mailchimp. You can also add new fields in the MailChimp based on the information available to you. 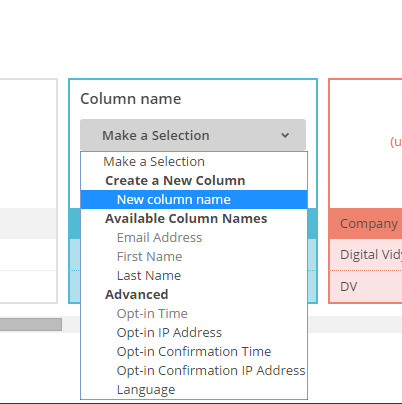 For example, if you have an attribute called “Source” that tells you the source of that particular user and you need that information in MailChimp to create source wise segments, you can add a new field by the name “Source” by clicking on New column name and creating a new custom field. Click “Next” once you are done with all the columns and then add them on your subscriber list. Please be very careful while doing this task. If something wrong happens here, it can cause a big trouble later. Map the fields with the right Label, for Example here, Deepesh is mapped with the First name field correctly and email is also mapped to the correct field. Login in to your Mailchimp Account and Create your List. You will be asked to provide default information that will be used while sending campaigns. You can change this information for each individual campaign later as well. Once the list is created, go to “Import Subscribers” in “Add Subscribers” Section. Upload the CSV file, you have created in the last step. Once you have uploaded the sheet, you will be on a page something like this. Here you can map the fields of the sheet with the fields you want to keep the list. Do ensure that you follow the guidelines properly.